Our beautiful Agung Ngurah Bagus Pranajaya was born 6th of Nov 2004. First child to a loving couple, the father working as a cashier in a Kuta Hotel and the mother taking care of a small Warung by their home. 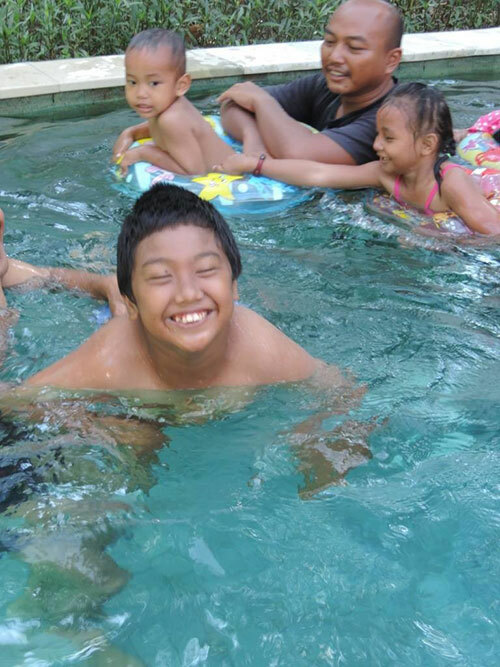 They struggled for 10 years trying to understand and take turns to take care of Agung, as they realized his disabilities. They live together with cousins, aunts and grandparents who take turn looking after him so they can make ends meet. When the family found MTC in 2014 they realized the importance of giving their son the opportunity to improve his quality of life. Although it is still difficult to coordinate time for him to receive therapy and play with the children, since they have full time jobs, and another son to take care of, they do their best to bring him to Happy Therapy Day as well as twice more for therapy during the week. They have also began using all techniques taught to them for use at home. Although it is still an endeavor to look after him, his condition is unceasingly improving. When he first arrived, he was very shy and withdrawn, once exposed to the plethora of activities available, including swimming which is his favourite, as well as therapies, he began to bloom. Being surrounded by friends with similar disabilities has also given him the motivation to open up and challenge himself. His smile lights up the room, and it is so precious to watch him be quite determined to finish an art project, or kick around full of mirth while in the water. Receiving these tools of possibilities and being part of a loving community and family allows him to be more self aware and ready to overcome these limitations while also attending school at YPAC during the week in the mornings. The family continues to battle with financial constraints so please feel free to donate. We appreciate any help and contributions.